Kopper Kool water-cooled, hydraulically-actuated clutches were supplied by Wichita Clutch for use on a large load winch drive system aboard an anchor handling tug supply (AHTS) vessel. The AHTS is specifically designed for towing and anchoring semi-submersible oil and gas exploration drilling platforms. In deep water exploration fields, drilling platforms are tethered to the seabed more than a mile beneath the surface. The vessel features a large diameter drum, 600 ton capacity winch and two smaller diameter drums, 500 ton capacity winches which all accommodate heavy-duty cable up to 3 in. diameter. The ship has an open stern allowing for easier cable access and the decking of anchors. The 43.5 in. diameter KKC 336H clutch models provide enhanced operational safety due to their ability to slip under torque overload during snag conditions. In rough seas, the clutch slips to provide wave compensation while reducing overload/strain on the winch drive system. This slip power handling capacity is achieved by use of continuous water cooling flow beneath the copper alloy wear plates that come into direct contact with the friction material. The Kopper Kool units offer the additional benefit of increased payout speeds by allowing a slip differential across the clutch while maintaining fine payout tension control. This is especially important when carefully lowering equipment or anchors to the seabed in high wave conditions. The clutch can provide emergency payout by releasing all tension if a problem occurs, such as when a cable gets severely misaligned to the side of the vessel while performing towing operations. The winch drive system also incorporates six Wichita LKB spring-set brakes, which function as static holding brakes. The brakes are mounted opposite of six motors on 3 gearboxes. A major elevator OEM specifies Twiflex VKSD disc brakes for use on high-performance elevator drives installed in skyscrapers.The dual function brakes stop the elevator cars precisely at the correct floor level and also decelerate the cars in an emergency (such as a malfunction). 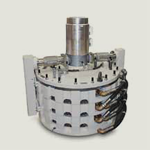 Two caliper modules are used on each elevator drive to provide the required redundant safety. 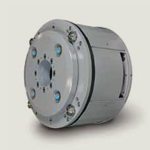 Unlike electromagnetically actuated brakes found in conventional elevators, the VKSD brakes are hydraulically actuated since each caliper’s clamping force exceeds 100 kN.A dedicated dual-circuit hydraulic unit (also supplied by Twiflex) generates the necessary oil pressure for both brake calipers. The brake system is designed to dissipate the large amount of kinetic energy (which may exceed 2 kWh) generated bythis high rise elevator application. Brake disc temperature can rise bymore than 100K during an emergency stop. The Twiflex VKSD disc brake caliper range is available in a standard configuration comprising two spring modules acting on each side of the disc or, as shown above, as a 'floating' brake. The minimum disc thickness is 20mm, minimum disc diameter is 1000mm. Rated braking force extends from 28 kN to 119 kN, with a nominal coefficient of friction mu = 0.4. Wichita	Clutch	has	supplied	AquaMaKKs	low-inertia,	spring-set	brakes	(LI-SSB)	for	use	on diving	support	vessel	(DSV)	mooring	winches. The	DSV	is	used	for	inspection,	maintenance and	repair	of	offshore	oil	and	gas	pipelines	and	platforms. A	4-point,	computer-controlled mooring	system	maintains	the	ships	position	over	a	dive	site	while	compensating	for	swell, tide	and	prevailing	wind. AquaMaKKs	LI-SSB	brakes	are	installed	on	each	of	the	mooring	system’s	four	deck-mounted, AC	motor	driven	winches. The	units	serve	as	stop-and-set	parking	brakes	to	hold	the	vessel in	precise	position. In	the	event	of	power	loss,	the	brakes	are	calibrated	to	provide	a controlled	emergency	stop	which	prevents	vessel	drift	while	protecting	drivetrain	components. The	AquaMaKKs	LI-SSB	has	been	specially	modified	to	withstand	highly	corrosive	sea	spray and	direct	seawater	splash	prevalent	in	marine	deck	areas. These	LI-SSB	models	utilize	the standard,	offshore-proven,	AquaMaKKs	brake	housing	which	features	three-part	epoxy marine	grade	paint	and	stainless	steel	hardware	for	added	corrosion	protection. Special	alloy stainless	steel	wear	(center)	plates	are	also	incorporated	to	resist	damage	from	corrosion. An	engineered	friction	material	was	specially	designed	to	run	against	the	stainless	steel wear	plates. AquaMaKKs	LI-SSB	air-cooled,	air	tube	release	high-torque	brakes	are	available	in	the 19,	25,	and	36	inch	sizes. Units	feature	a	shim	design	that	makes	it	easy	to	maintain	and adjust	for	wear. Models	can	be	easily	converted	into	water-cooled	brakes. Twiflexis chosen to supply braking systems to multiple shiplifts in the Asia Pacific region because of its superior technology and experience in the industry. A recent application involves the Gaobazhou Hydroelectric Dam shiplift located 12km from the convergence of the Qing Yangtze Rivers. The total capacity of the Gaobazhou powerstation is 252MW and the yearly output of electricity is 898 million Kw. h. The damis 435.9m wide by 83m tall. The shiplift at Gaobazhou is designed to liftships weighing up to 300 tonnes and is the only means of navigating the powerstation dam. Ships sail directly into a large water tank. Water gates then seal the tank at each end and a 300kW hoist lifts the tank (with ship inside) 40.3m to the upper level. The gates then open and the ship sails on up river. The whole exercise takes less than 12 minutes; considerably faster than a conventional lock gate arrangement. Four 75kW motors drive a total of eight hoists. The total lift is 1560t but a counter balance of 1024t brings the out of balance load to just 536t. A total brake torque of 1840kNm is required to arrest the hoist under emergency conditions. The 4 VCSmk-lll working brakes assist in stopping the hoist and the 24 VMS-2 safety brakes come on at full torque in order to “park” the system. The VMS-2 brakes come in on a “step-by-step” method to arrest the hoist in a smooth and efficient manner.